Should be willing and capable of negotiating with the stakeholders to find resources for sustainable ICOS activities in the country. The UK National Focal Point is Professor Andrew Watson (University of Exeter). The National Stakeholder is a representative of the country who can liaise between the national funding agencies (NERC, Defra, DECC), the ICOS Thematic Centres and Head Office. 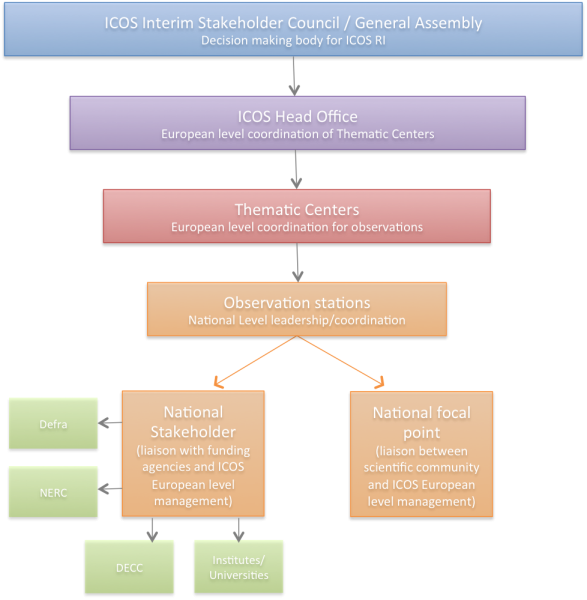 The National Stakeholder is also eligible to attend the ICOS Stakeholders Interim Council/General Assembly (the decision making body of ICOS). The UK National Stakeholder is Professor Richard Sanders (National Oceanography Centre).